Today Google announced that Premium users of Google Analytics will be able to access their data via Big Query, Google’s data solution that allows users to make sense of massive data sets. While the announcement occurred today, users will have to wait until later in the year to be able to use BigQuery to perform analysis that is usually very difficult to perform in traditional environments. For those of us are used to only being able to export tens of thousands of rows of data from Google Analytics this may not be a big deal, but GA premium users will be able to evaluate data that contains trillions of rows! That is an incredible amount of data being made available! How this Impacts Google Analytics Users? Most users will not be impacted by this change, only those who have enough page views and business needs to warrant the investment in Google Analytics Premium. The companies who use GA premium will see tremendous benefit in being able to quickly and easily query the information they have stored in Google Analytics and gain insights into their business that were previously unknown or unavailable. The ability to conduct massive queries and even export data out of Google Analytics creates an opportunity to link GA data with data warehouses, creating analysis opportunities that will make analysts salivate. The best part is that everything is in the cloud, so you do not need to invest in hardware to get the job done. Speed, scale and reliability are all key parts to timely data analysis, and these are now built directly into the Google Analytics product for premium users. Seeing this announcement makes me think back to a day when I had to wait an entire day to run a complex query on a data set of 100,000 records in SQL Server. We have come a long way since then! If you are interested in signing up for BigQuery and you are a GA Premium User, you can use this form to become the first to sign up. 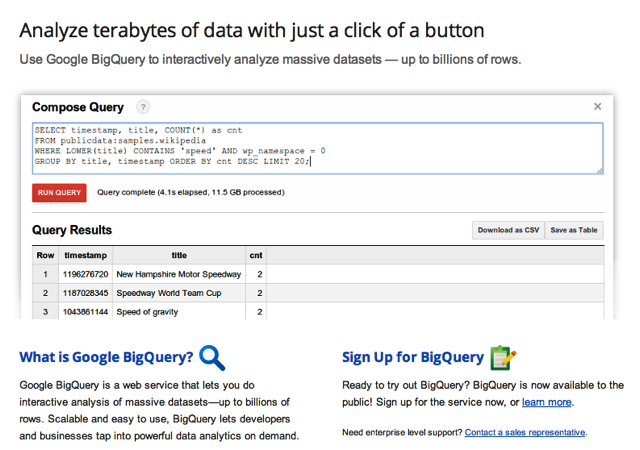 Here is Google’s official announcement of BigQuery in Google Analytics Premium.